This Is The Place Heritage Park is a collection of more than 40 historic homes and buildings also known as Old Deseret Village. 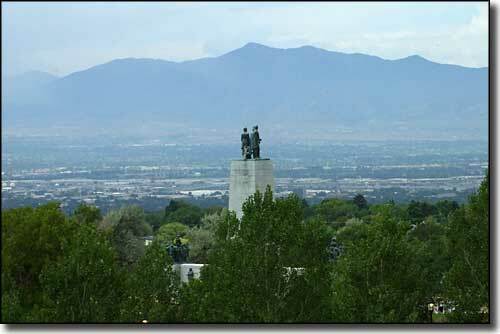 This is the place where the first Mormon pioneers decided "This is the place," and began to build their communities. 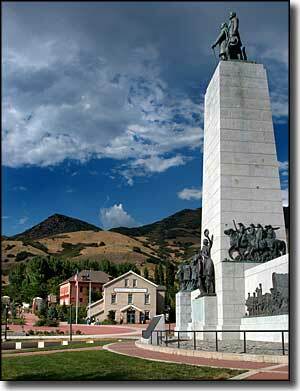 This Is The Place Monument is here and it marks the end of the 1,300-mile Mormon Pioneer Trail. This Is The Place Foundation manages the 450-acre living history park. This Is The Place Monument is open daily from dawn to dusk. Admission is free. Heritage Village is open daily from 9 AM to 5 PM. From May to September (except on Sundays when the program is limited and prices are the same as winter): Adults: $8, Children 3-11: $6, Seniors (55+): $6. From October to April: Adults: $5, Children (3-11): $3, Seniors (55+): $3. View of Salt Lake City courtesy of Tricia Simpson, CCA ShareAlike 3.0 License. Photo of This is the Place Monument courtesy of Cory Maylett, CCA ShareAlike 3.0 License.